Drugs.ie recommend that you read their tips for creating entries and their recommended research sites before you start creating your entry. You can find the research site links at the bottom of this page. You can download all of the tips and use them as guidance as you develop your entry. Decide if you will work on an individual or group project. People are welcome to enter the competition as many times as they like. People can submit through individual and or group entries covering different themes and ideas. Research your theme so you have a good understanding of the issues that you will cover in your entry. Pick which topics you will discuss and find facts and figures to support your viewpoint. Try not to cover too many issues in one entry. You can always explore different ideas in separate entries. Think outside of the box – include messaging that will appeal to young people. Show what you think people your age want or need to know about drugs and alcohol. Drugs.ie recommend that you check out previous competition winners on the site to see what the judges are looking for. Remember to use previous entries for guidance but don’t copy the entire entry. The judges want to see new ideas each year. There is a lot of information available about drugs and alcohol on the internet, some of which is not always accurate. Drugs.ie provide a list of recommended websites at the end of this page for you to check out. Write down facts that you find useful from your research and where you sourced them from. Consider double checking facts and figures to make sure that they are correct. Don’t make statistics up. If your entry is in an Irish context (based in Ireland), make sure your facts and figures are relevant to Ireland and not other countries like England or America. Remember that Ireland’s facts and figures on drug and alcohol use will be unique to Ireland. Personal stories will be accepted as well as fictional stories. Be careful not to identify anyone in personal stories that you share. If you are sharing someone else’s story - don’t forget to ask their permission first! The judges are looking for original work, not work that has been previously published elsewhere (even the internet). The judges want to see your viewpoint, not someone else’s work! The judges won’t accept any entries that contain commercial messages. . This means that you can’t show branded labels on clothes, food or alcohol. Remember to fill out an entry form. Entries without entry forms can’t be put forward for judging. Drugs.ie don’t send entries back. Drugs.ie receive hundreds of entries to the competition so are not in a position to return entries to people. Remember to save entries on your computer or to take photos of posters before you send them. Read through different news articles (print media, online news sites, blogs) to get some inspiration. Drugs.ie recommend that you check out their news section and the previous article winners on the site. Try not to cover too many topics in one entry. Don’t forget- you can enter separate entries covering different issues. This mean that you can enter the competition as many times as you like with different entries. Decide if you want to create your entry as a newspaper article or as a blog post. You can find some inspiration for blog posts from looking at the pieces written by young people on Spunout.ie. Decide who your target audience is. Your target audience is who you want to read the entry. Is it someone your age, someone older or younger, a parent or a teacher? This will help you to decide what style of language to use in your entry. Decide if you will use formal or informal language. You might use ‘slang’ terms if it is aimed at a younger age group so they can relate to it. Start off by developing a plan on how you will structure your entry. Generally you will have an introduction, paragraphs that contain the main information you want to get across and a conclusion where you reflection on the points you discussed in your entry. If writing a newspaper article, remember to think like a journalist and try to engage the reader in the first paragraph. The first paragraph should discuss the main points or the main story. Write down facts that you find useful from your research and where you sourced them from. It can’t hurt to double check facts and figures to make sure that they are correct. Don’t make statics’ up. Don’t waffle or make the report too long, keep sentences short and to the point. If you are writing your piece in an Irish context (based in Ireland), make sure your facts and figures are relevant to Ireland and not other countries like England and America. Remember that Ireland’s facts and figures will be unique to Ireland. The judges are looking for original work, not work that has been previously published elsewhere (even the internet). Feel free to include quotes from people. Perhaps you could interview people at school, people in your community or people that work in drug and alcohol services? If you are quoting a piece of research or someone you’ve interviewed, don’t forget to include the source/their full title with your entry. Sometimes journalists sensationalise stories, try and engage people with balanced, factual and respectful information. It is important to remember that the judges are looking for newspaper articles or blog posts and not essays so keep the word count between 600-1000. Check your spellings. Get someone to read over your work and double check your spellings. Don’t forget to download an entry form and send it with your entry. An entry without an entry form cannot win a prize. Article entries will be considered for publication by the Irish Times Student Hub. You can read which 2016 article they featured here. Don’t forget to fill out an entry form. Make sure your email address is correct and legible so we can contact you through email. Decide what type of video that you want to create. There are lots of options you can explore when creating a video entry. Some ideas are; short film, animation, stop motion, interview, feature, mini documentary or music video. The style of video you choose is up to you! A video entry could be set anywhere in your social environment. If creating a news piece, watch various news or current-affairs programmes to see what structure they tend to follow. Think outside of the box and create a video with messaging that you feel people your age will like. Try to not cover too many issues in one entry. Remember that you can enter the competition as many times as you like with different ideas. Make sure that your video flows well and doesn’t have random scenes that don’t tie in to the overall theme of the video. Consider a narrative structure. 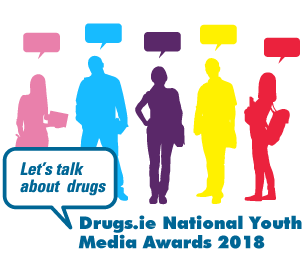 Look at the previous winners section on drugs.ie to watch some of the winning videos from previous year’s competitions. Remember to use these videos for guidance and don’t copy the entire entry. The judges want to see new ideas each year. Try to engage the viewer from the very start- but keep it short- between 1 and 3 minutes in length. Do not include specific commercial messages, brands or companies. This means that you can’t show branded labels on clothes, food or alcohol. You are free to use a variety of voices and/or sound effects and music in your entry- as long as you own the copyright. This means that you cannot use a recording in your video that is owned by an artist or by someone else. Be sure to check if the recording you use is subject to copyright. Some recordings can be accessed online for free, others you have to pay for. If you gain permission to use someone else’s work remember to include the permission with your entry. Entries that use unauthorised material cannot be broadcast on the drugs.ie site, therefore they cannot be put forward to win prizes. If interviewing people, feel free to include clips from people that you interview. Please include the source of your interview in additional notes with your entry. Write down facts that you find useful from your research and where you sourced them from. Consider double check facts and figures to make sure that they are correct. Don’t make statics’ up. If you are writing your piece in an Irish context (based in Ireland), make sure your facts and figures are relevant to Ireland and not other countries like England and America. Remember that Ireland’s drug and alcohol facts and figures will be unique to Ireland. A selction of previous winning entries and entries to the 2017 comeptition will be screened at the Audi Dublin International Film Festival. Don’t forget to fill out an entry form. Make sure your email address is correct and easy to read so we can contact you through email. If you are sending your video through post, Drugs.ie will only accept CD-R, DVD Video, DVD-R or USB memory stick. Please note, Drugs.ie are not in a position to return entries. If emailing your entry, the maximum file size accepted via email for all formats is 24MB. There are no upper file size restrictions on entries submitted through the postal service. Decide what type of audio entry you want to create. Remember that you can enter the competition as many times as you like so you can try out different ideas with separate entries. Some suggestions for audio entries are; a chat show, news feature, spoken word (poem), rap, song, interview, a recorded story or an instrumental piece of music. You are free to use a variety of voices and/or sound effects and music in your feature – as long as you own the copyright. This means that you cannot use a recording or piece that is owned by an artist or by someone else. Be sure to check if the recording you use is subject to copyright. Some recordings can be accessed online for free, others you have to pay for. If you gain permission to use someone else’s recording, remember to include the permission with your entry. Entries that use unauthorised material cannot be broadcast on the drugs.ie site, therefore they cannot be put forward to win prizes. If you are creating a journalistic entry, listen to various radio programmes (and different radio stations), paying close attention to their news and current affairs programmes. Does your local area have a youth radio station or youth focused show? Try listen to some radio shows aimed at young people to get some ideas on what style would appeal to them. If creating a rap, song or piece of music, listen to different styles of music for inspiration. A lot of artists will incorporate the theme of drugs or alcohol in the lyrics of their music. Some Irish artists have songs about drug use in their local communities, remember that your audio entry can be about your local community too! An audio entry is a very powerful way to tell a story. Remember to engage the listener and keep it short, audio entries should be no longer than 3 minutes long. Research drug and alcohol facts as well as checking out the drugs.ie news section on the website. If entering a poem, rap or song, include your written work so the judges can read the words/lyrics. If interviewing people, feel free to include clips from people that you interview. Please include the source of your interview in a notes with your entry. Audio files will only be accepted in the following formats: .wav or .mp3. Entries submitted through the postal service will only be accepted on on CD-R, DVD Video, DVD-R or USB memory stick. Please note, we are not in a position to return entries. Remember that a poster should show information from a distance as well as up close, so try to use clear, eye-catching elements that grabs people’s attention. There are many different styles of poster, research online and offline and decide which style best suits your idea. Decide if you want text on your poster. Some entries will just use imagery to portray their message. It is up to you to decide what you feel is more effective. Remember that typography (lettering) on a poster can have a large impact as well as visual imagery. Look at health campaigns aimed at young people to see what style of imagery and messaging that they use. Some examples of public health campaigns aimed at young people are ‘The Little Things Campaign’ by the HSE, Alcohol Action Ireland Campaigns, SpunOut campaigns and Drugs.ie campaigns. Look at previous poster winners on the Drugs.ie site to see what the judges are looking for. Remember that sometimes, less is more - try not to cover too many issues on one poster, remember that you can enter different poster ideas through separate entries and enter as many time as you like. Think outside of the box and create a poster with imagery and/or messaging that you think will appeal to people your age. Drugs.ie cannot return entries so take a photo of your poster before you post it in. You can submit your poster through email or through the post on a USB memory stick or CD_R. Please note, Drugs.ie are not in a position to return entries. Drugs.ie recommend the below websites for sourcing valid information on drugs, alcohol and related issues. Drugs.ie is Ireland’s national drug and alcohol information and support website. It provides information on drugs and alcohol that is relevant to young people, parents and professionals. The below pages on the Drugs.ie sites are relevant to the 2018 competition themes. Performance and image enhancing drugs – what are the risks? A profile of clients attending the health promotion unit - needle exchange at Merchants Quay Ireland. North Inner City Drug and Alcohol Task Force. (2015) Just saying... the views of young people about drugs and alcohol. Dublin: North Inner City Drug and Alcohol Task Force. TNS Political & Social. (2014) Flash Eurobarometer 401. Young people and drugs. Luxembourg: European Commission. Blanchardstown Local Drug and Alcohol Task Force. (2016) Drug and Alcohol Trends Monitoring System (DATMS) 2016. Dublin: Blanchardstown Local Drug and Alcohol Task Force. Aware - Founded to assist those directly affected by the illness of depression. Safe Ireland - National network of organisations who support women experiencing domestic violence. Women's Aid - National organisation working in Ireland to stop domestic violence against women and children. Amen - Provides a confidential helpline and support and information service for male victims of domestic abuse. Childline - Support service for young people up to the age of 18. Support families impacted by a loved ones’ addictive behaviour. Offer family programmes and one-to-one counselling service. Tel: (01) 764 5131.